Haruka is a oni-eating tengu, the strongest of all youkai. Kantarou, having named him, became his master and friend. Haruka has the ability to control lightning. Occasionally, such as when he is attacking oni, Haruka can transfigure into his true youkai form. His nails grow sharper and longer, his fangs grow longer, and his eyes constrict. 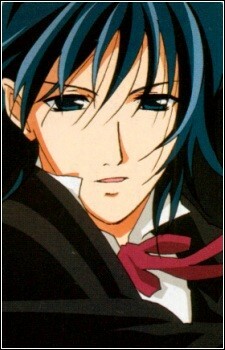 Usually, he appears as a tall, dark-haired man with black wings that he can either hide or reveal. Haruka is troubled by his lack of memories, inability to eat youkai, and loss of power, which starts to affect his sense of self. Haruka's name under his previous master, an onmyodo practitioner, was Rin. As Rin, he did not have a good relationship with his master, and it is hinted that she took advantage of his subservient status for sexual purposes. Source: Wikipedia.